This card which we made at Class last week is in style a CASE of page 18 of the Stampin' Up! Holiday Catalog. I LOVE the offset gatefold design of that card, so I just had to make one. 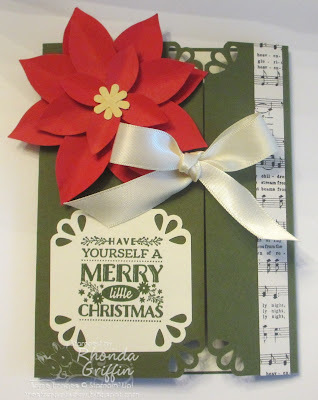 I used the more intricate of the curvy corner punch edges and filled the slot/ribbon slide punch with larger ribbon. Of course the colors and sentiments are different as well. I had to line the inside with a Very Vanilla layer that was larger than usual so that it would look pretty under the punched corners. That layer is 5-7/8" by 4-1/8".